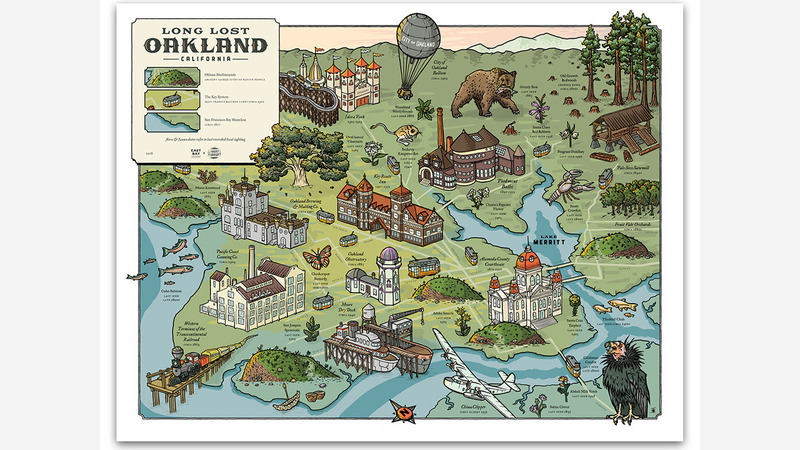 In his podcast East Bay Yesterday, amateur historian Liam O'Donoghue revisits parts of Oakland have been destroyed or transformed. Now, a new map he's created in collaboration with artist TL Simons allows others to explore the city that once was. 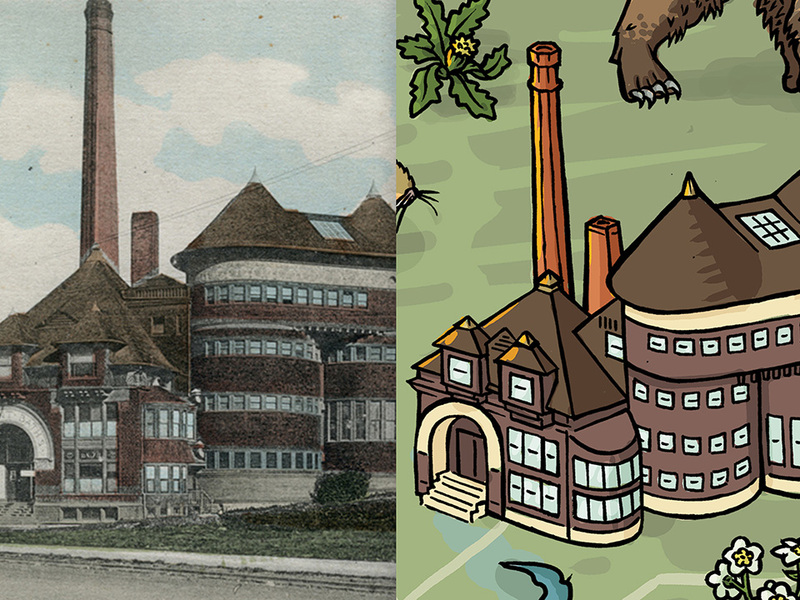 Launched on Kickstarter as a multimedia project with podcast episodes and walking tours, Long Lost Oakland includes architecture, railways, wildlife, and people from the city's history. 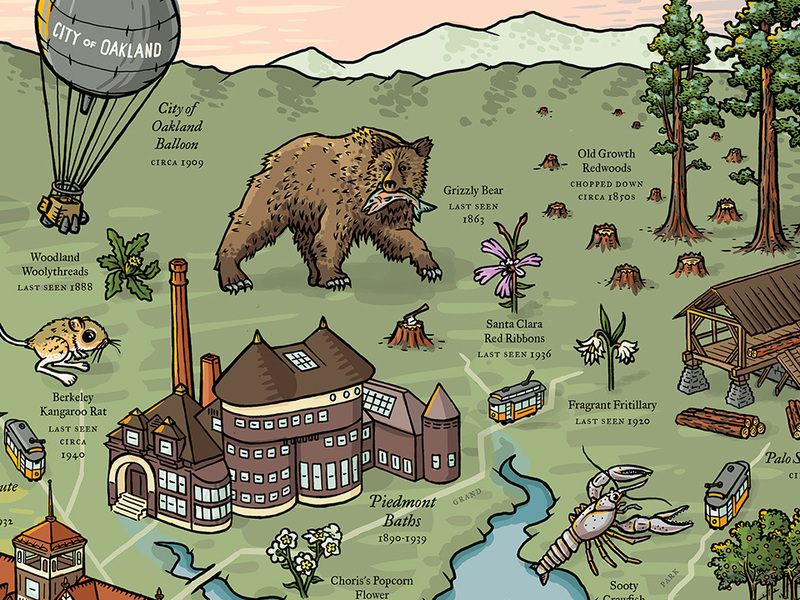 On the printed map version, grizzly bears prowl the hills, Ohlone watercraft bob alongside the Moore Dry Dock in West Oakland, and the old Key System railway crawls across the map. O'Donoghue said the project was a process of continuous discovery made more urgent by the city's rapid pace of change. "I was just realizing that everyone who had been here for a while had stories I'd never heard," he said. 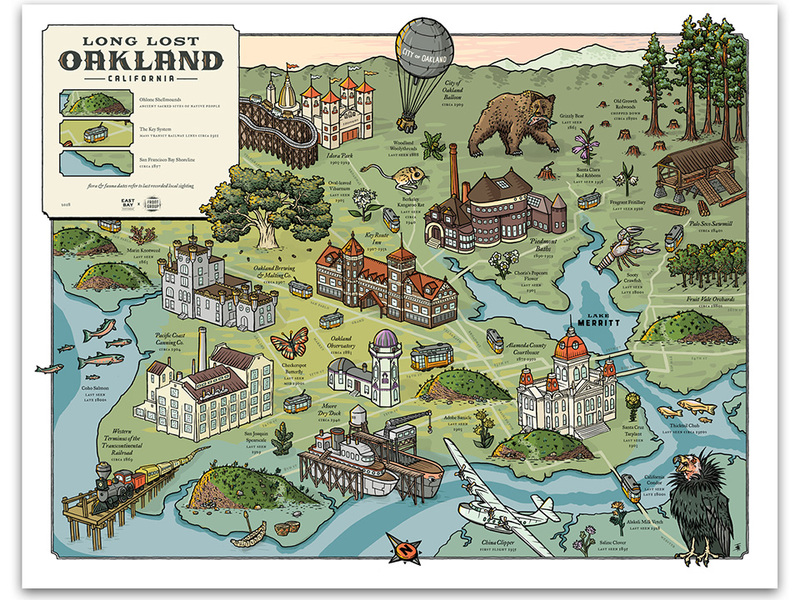 To get Long Lost Oakland going, O'Donoghue set a goal of raising ten thousand dollars, eventually collecting nearly $23,000 from more than 500 backers. Though the map is not yet available to the public, O'Donoghue will have a few copies for sale at an upcoming event with the California Historical Society on June 27, with copies generally available by July. Educators can obtain a copy for free, and O'Donahue has so far heard from around seventy teachers in grades K-12. "I'm excited to see it incorporated into curriculum," he said. O'Donoghue, who has worked as a journalist, moved to Oakland in 2003. Since then, he's taken a keen interest preserving local history. He said the current rate of construction can be challenging for longtime residents. "And with people moving out, leaving Oakland because of displacement, there was a fear that Oakland was losing its history," he said. Viewers might recognize reference points such as Telegraph and San Pablo Avenues, but not in their current forms. "They're not roads, they're rail lines," said O'Donoghue. "They correspond to roads, but the roads came later." A few architectural relics remain, at least in part, such as the Piedmont Baths which were largely demolished, even though portions of the structure were integrated into the Grand Lake Whole Foods. For the most part, the landmarks, and species depicted have completely vanished. "The overall mission of this map isn't just to show cool stuff that used to be here, but understanding how we got to where we are now," said O'Donoghue. "How can we learn to navigate the rapid changes we're facing now based off periods of rapid change in the past?" Listen to the first episode in the Long Lost Oakland miniseries of East Bay Yesterday by clicking here.